The Denver, Colorado housing market is tighter than it ever has been before in 2018 and that means more people are staying in their homes and upgrading rather than move out. This also means that people flipping houses in Denver have a real chance to make some serious cash if they do it right. 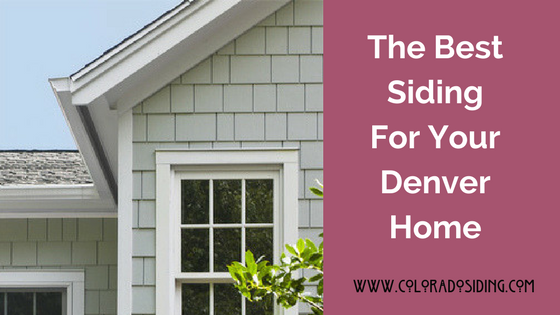 Regardless of whether you are looking for siding for a home remodel or for a flip, knowing the ins and outs of your siding choices is key to making the right decision. At Colorado Siding we have taken the time to write a quick siding guide for you to reference in order to choose the siding that is the best for your situation. Vinyl siding is probably the most common siding in the US today. The reasons why people love it for their homes is because it’s long lasting, inexpensive, and virtually maintenance-free. It never needs to be painted, is easily cleaned and lasts about 40 years. Wood siding is one of the oldest types of siding on the market and a favorite for those seeking a rustic look. Although the types of wood used for wood siding (Cedar and Redwood) are naturally decay-resistant, it is flammable which could be a problem in Colorado. It requires more maintenance than other types of siding but damaged boards are easy to replace. Fiber-cement siding is a composite of cement, sand, and cellulose fiber. It has all the fantastic qualities of vinyl and the look of wood, making it a great choice for form and function. It is less expensive than wood but more expensive than vinyl. However, the look and quality make it well worth the extra expense. If you are interested in any of these types of siding for a Denver home that you are remodeling to keep or sell, Colorado Siding is a great choice for installation as we have been installing these types of siding for over 25 years. Contact us today for a free consultation.